Win Two Tickets to Science of Wine Orlando — Rona. Win two tickets to Science of Wine Orlando. Now that I got SEO out of the way, let me explain. For eight years running, the Orlando Science Center has hosted a way-fun fundraiser. It’s for grown-ups only, and it’s themed around celebrating science while enjoying chef-prepared foods and fine wines. Now it’s time for the 9th Annual Science of Wine. The crux is that about 30 Orlando-area foodservice establishments will be dishing out their own sweet or savory, or sweet and savory, science experiments, and 140 wines will be poured. 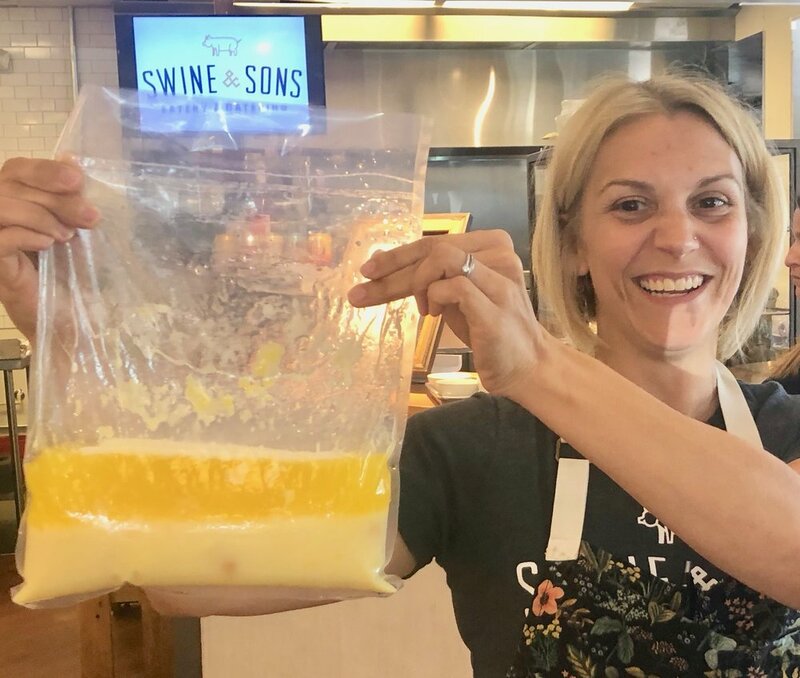 Chef-owner Alexia Gawlak of Swine & Sons shows off the ingredients she later emulsified to make Béarnaise sauce. In addition, you can attend a demonstration by chef-owners Alexia and Rhys Gawlak of the deli and caterer Swine & Sons. The duo will embrace the scientific concept of emulsion by emulsifying – blending liquids together, as in how mayonnaise is created. They’ll drizzle what they make over something delicious. As a sample, I tasted a Béarnaise sauce over asparagus and thinly sliced country ham. The chefs are still finalizing the Science of Wine offerings. Separately, you can learn about how wine is produced in a seminar called How’d It Get There? Julie Pepi, CSW director for fine wine in Florida for Trinchero Family Estates, will be one instructor. At her side will be Shaun C. Wright, fine wine manager for Southern Glazer’s Wine and Spirits. 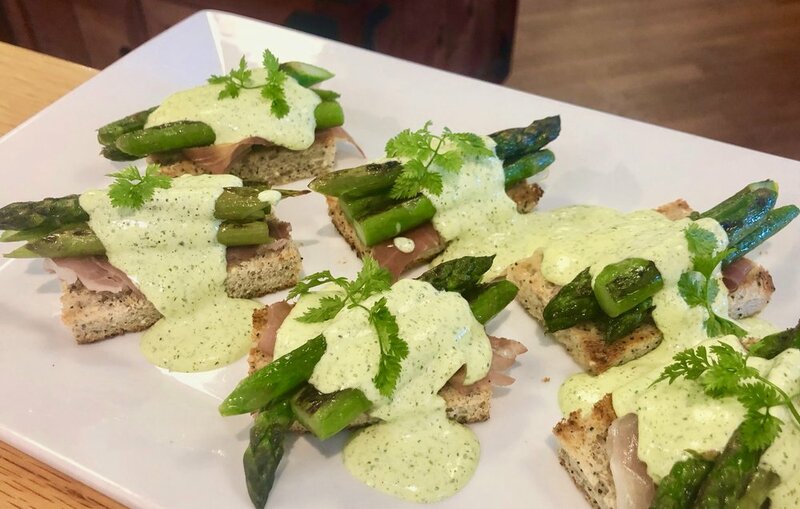 California asparagus and thinly sliced country ham topped with a chervil-laced Béarnaise sauce. Watch the chefs of Swine & Sons makes something sort-of similar as they talk about the science of emulsion during Science of Wine Orlando. Both seminars will cost a small sum above the base ticket price. You’ll learn a bunch, and you’ll be helping the Orlando Science Center, which is an amazing place for Orlando’s children to learn and play. We’re talking tots through tweens, honestly. You can guarantee yourself a go at this entire extravaganza by buying a ticket $125, or $100 if your’e a member. The seminars are an extra $20 apiece. That’s your best bet. Post or repost about how to win two tickets to Science of Wine Orlando via me (OnDining) on Facebook and tag (with the @) two friends who you’d like to join you. Please also include @orlandsciencecenter and #scienceofwine. OR, follow me (OnDining) on Facebook and tag two friends plus @orlandsciencecenter and #scienceofwine in a comment on my post about this raffle. Post or repost about how to win two tickets to Science of Wine Orlando via me (RonaGindin) on Instagram and tag (with the @) two friends who you’d like to join you. Please also include @orlandsciencecenter and #scienceofwine. OR, follow me (RonaGindin) on Instagram and tag two friends plus @orlandsciencecenter and #scienceofwine in a comment on my post about this raffle. Post or repost about how to win two tickets to Science of Wine Orlando via me (RonaGindin) on Twitter and tag (with the @) two friends who you’d like to join you. Please also include @orlandsciencecenter and #scienceofwine. OR, follow me (RonaGindin) on Twitter and tag two friends plus @orlandsciencecenter and #scienceofwine in a comment on my post about this raffle. FOOD SCIENCE! I just entered to win two tickets for #scienceofwine at the @orlandosciencecenter via @RonaGindin #ronarecommends. Hey @friendsname and @friendsname, who wants to go with me? Or, again, go to one or more of these posts, follow me on one of the three social media channels, and tag two friends plus @orlandsciencecenter and #scienceofwine in a comment. SIMPLE. Of course, you can also just subscribe to my blog. That’s easy, and my occasional newsletters will let you in on the most interesting goings-on about town. I’m very choosy about what I include. Simply enter your email in the box on the right side of this page. The 9th annual Science of Wine, presented by Southern Glazer’s Wines and Spirits, will be held on Saturday, April 27, 2019, from 7pm to 10pm. I’ll pick a winner – it’ll be a random drawing – on Wednesday, April 24, at 3pm. That’ll give the winner time to get the tickets from me, and it’ll give the rest of you a window to buy your own. Ready to enter? Subscribe now, or click on the Science of Wine Orlando posts on my Facebook, Instagram or Twitter feeds. Remember to tag two friends, and remember to check back on April 24 to see if you’ve won.